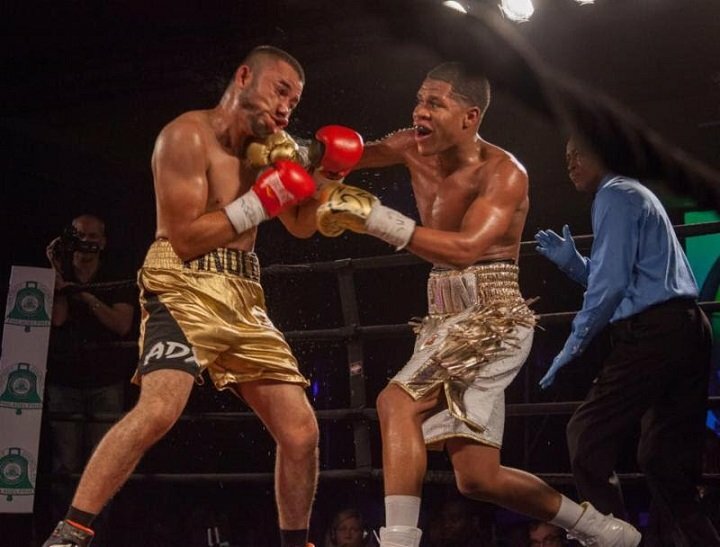 Last Friday at the SugarHouse Casino, in Philadelphia, PA, undefeated super-lightweight prospect, 18-year old sensation Devin “The Dream” Haney, improved to (17-0, 11 KOs) with a unanimous decision victory against Enrique Tinoco (16-5-3, 12 KOs) of Mexico. Tinoco, known for being a rugged fighter, was no match for Haney as he dominated from start to finish. Devin used his superior boxing skills to outclass Tinoco, working off angels, while landing his punches at will. In round four, Haney hurt Tinoco with a vicious straight right-cross, putting the Mexican native on wobbly legs, prompting a 10-8 round on one of the judges’ scorecards. Tinoco managed to survive to the final bell, but took a beating along the way. Final scorecards read 80-71, 80-72 twice. “Tinoco was a very durable opponent who’s been in the ring with some notable fighters,” said Devin Haney. “I knew if I stuck to my game plan, everything would work out. I’m only 18-years old, but I feel like a polished pro. With every fight, I’m learning something new. I just want to be the best possible fighter I can be. All the hard work is paying off. With the win, Haney, who currently holds the WBC Youth World Lightweight Title, has plans to get right back in the ring. Devin has already fought six times this year.